CoteN™ is Haifa's polymer coated Urea, set for 2 or 4 months longevity (@21C). CoteN™ is perfect crops with special emphasis on N management in the soil, such arable crops. When the weather gets colder, the N release rate becomes slower. This meets the decrease in nutrients consumption by the plant. This CRF technology ensures both precise plant feeding, and efficient nutrition with s minimum loss of N to the soil. Once the weather gets wormer and plants demands for nutrients increase, and so the release rate of Urea from CoteN™. Nitrogen is known to be illusive Nutrient. Urea, can Volatilize as Ammonia, or can be transform to Ammonium (NH4+) , then to Nitrite (NO2-) and Nitrate (NO3-). Ammonium (NH4+) can be uptake by the roots, and it can also be tied to the soil particles as they are negatively charged. Nitrate (NO3-), due to the negative charge cannot be tied to soil particles. It can be uptake by the roots, or it can be leached to groundwater. The speed of all these transitions is depends of the temperatures, water regime, soil type and the right bacterial groups present in the soil. CoteN™, Controlled release fertilizer is affected only by temperature. Similar to the effect that temperature has on plants. Single application, no need to fertilize again during the season. 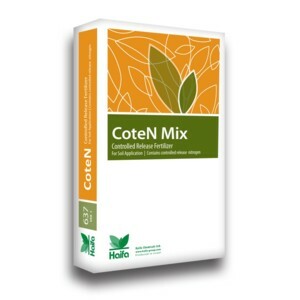 Haifa also introduced the CoteN™Mix concept: a wide range of CoteN™ based blends, bringing the CoteN™ added values to mixes of uncoated fertilizers to complete the P & K needs.